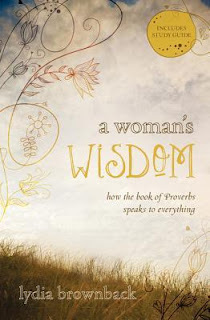 Today I've invited my friend Heather from Do Not Let This Universe Forget You to share her thoughts on A Woman's Wisdom : How the Book of Proverbs Speaks to Everything, by Lydia Brownback. Lydia Brownback is serious. We live in a foolish world, and the foolishness doesn’t stop at the doors of the church. Christians have a unique source of wisdom at our disposal: Fear and Knowledge of Jesus Christ. In A Woman's Wisdom , Brownback uses the book of Proverbs to speak to not only our proclivity for foolishness, but our primary need of Jesus, who was wise when we couldn’t be. In fact, my only gripe with the book is that it’s marketed very obviously to women. There are a few things that apply pretty exclusively to women in the book, and perhaps Brownback felt more comfortable addressing her own gender. But I honestly think the book holds enough for men too. After all, “The fear of the Lord is the beginning of wisdom, and the knowledge of the Holy One is insight,” (Proverbs 9:10) applies to all of mankind. Throughout the book Brownback holds up aspects of our lives to the light of God’s word, and who knew there were so many ways to be foolish! Take exaggeration, for example. This was something I’d honestly never thought of before and after citing what is the most terrifying passage of the bible in my humble o. “I tell you on the day of judgment people will give account for every careless word they speak, for by your words you will be justified, and by your words you will be condemned.” (Matthew 12:36-37), Brownback asks us to consider why we are embellishing the facts, and suggests we choose our words more fittingly and more carefully. But again she brought it all back to Christ whose speech was perfect and who never spoke an idle word. He did all of those things in order that His perfection could be given to us. There is so much here. I could probably go on forever, but I think it’s best if you read it yourself. She packs a punch and it might make you squirm, but afterwards she shows you the infinite joy and freedom of a life clinging to Jesus, and from that relationship gaining true wisdom. "In fact, my only gripe with the book is that it’s marketed very obviously to women." I would suspect that this is because Brownback is acting within the realm of a Titus 2 woman; an older woman teaching the younger. While it is certainly true that ALL Christians need wisdom, most Christian men learn better from other men. Perhaps the other book Carrie has reviewed, "Proverbs:Wisdom that Works," by Ray Ortlund, Jr. might be one of those books. Oh, my foolishness way too frequently reveals itself in my words. I truly love the book of Proverbs--it is so relevant regardless of the year or culture. @Sherry: Thanks! And I definitely didn't have a problem with her doing that at all. I just found myself thinking numerous times, wow, too bad guys are gonna miss out on this! I appreciate your comment about marketing to women. Proverbs (and indeed the rest of the Bible) is for mankind, not some small subset thereof. I think the problem is a symptom of the general fragmentation of marketing in publishing, which is a problem in all media, not just Christian publishing. Everything must be "targeted", with a clear genre and audience in mind. I suppose this helps sell books, but it also risks missing out on a broader readership. Carrie, how is it that your friends can write such a thorough book review as you? (Though I know you have inspired me to go deeper bc I happen to learn so much from you, and now Heather, too! Once again...I know I want to read this. Thank you! living in sin...hmmm..i would love to read this book! Thanks for your review. This sounds like a book I need to read.